Liz: It’s summer, so we’ve chosen two movies with beach settings—two very different movies. 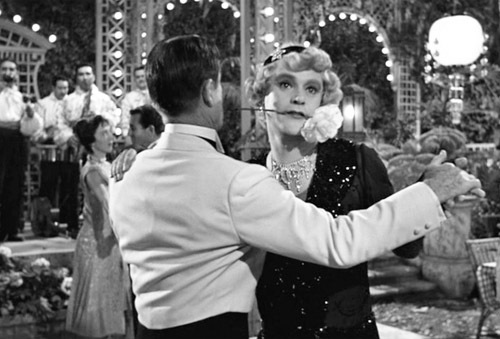 Speaking of settings, one of the interesting things about this week’s movie, Some Like It Hot, is the shift from prohibition era/gangster-filled Chicago to a peaceful Florida beach. It felt like a shift in time as well as place. But as Tony Curtis and Jack Lemmon were being hunted by the mob, a shift in place was an absolute necessity for them, and since they couldn’t really shift in time as well, they disguised themselves as women—in a female band headed to Florida. Trouble of a less violent nature, but worse than those high heels they had to wear, finds them in Florida as Tony Curtis falls for fellow band member Marilyn Monroe and Jack Lemmon is pursued by a millionaire. But, at least, no mobster would ever look for them in an all women band, right? No, they wouldn’t look, but gangsters take holidays too. 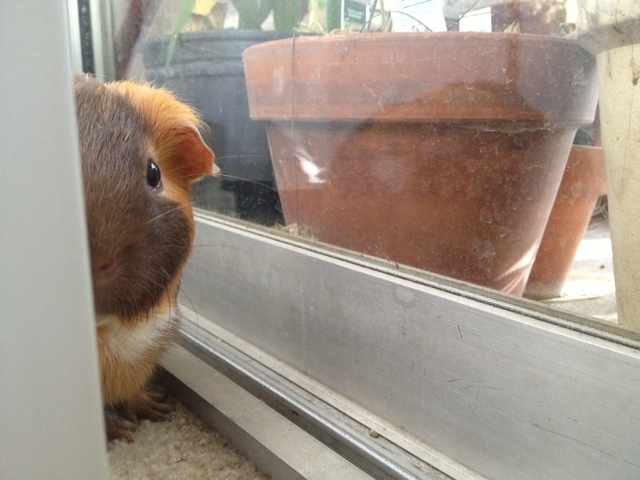 Jaz: For this post I would like to introduce you to my classic film companion: Beaver the guinea pig. He’s a little shy with strangers. What with the general viewing public’s short attention span, it gets harder and harder to find willing victims. Beaver will watch anything, provided he has something to munch on. 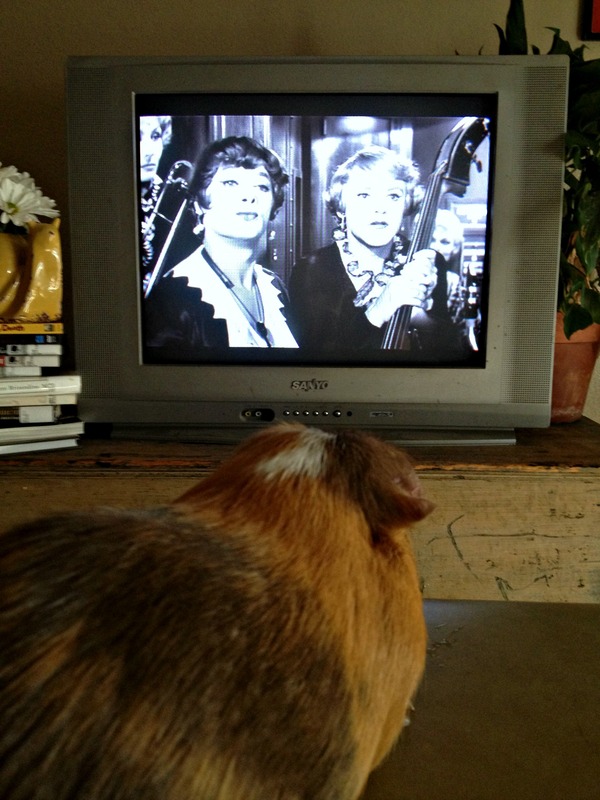 Beaver thinks Tony Curtis makes a convincing female. Tony Curtis’ millionaire act made me laugh too, especially since his stuffy accent sounds almost exactly like Cary Grant’s. 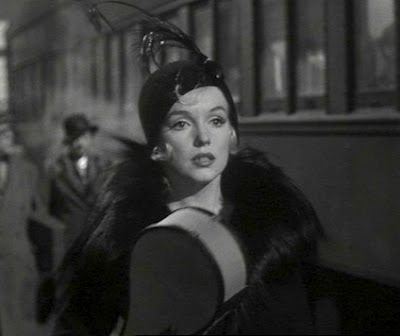 This was my first introduction to Marilyn Monroe – or perhaps I should say her character role. Ditzy, unbelievably naïve, with a weakness for tenor sax players and wearing a dress that reminds me of ancient Minoan fashion. You know, the ones that highlighted the women’s … er … curves. No, this isn’t the dress. Beaver gives this movie 5 carrot sticks (out of 5). I concur.